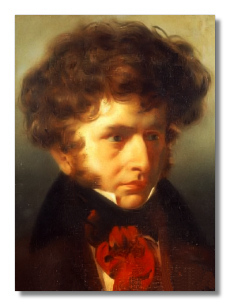 Louis-Hector Berlioz (December 11, 1803 - March 8, 1869) was born in southeastern France, near Grenoble. On a clear day, he could see the Alps and Mont Blanc. He received the bulk of his education primarily at home from his father, a prosperous and well-regarded doctor. His studies included Latin and music. He learned the flute well enough to consider it for a profession and, by all accounts, became an astonishing performer on the guitar. His passion, however, was going through scores, particularly of the 18th-century French operatic school, and he fell in love with the operas of Gluck. His father insisted that the boy study medicine, but young Hector had his heart set on music, specifically the profession of composer. His father not unreasonably thought him out of his mind, since until the age of 17 or 18, the son – acknowledged today as one of the masters of orchestration – had never heard an orchestra. They compromised. Hector would study medicine in Paris and, as a carrot, music at the Conservatoire "in his spare time." He worked conscientiously at his medical studies for a year and spent much of his free time at the library of the Paris Conservatoire poring over scores. He even copied out an entire Gluck opera. At the end of the year, he told his father he would not go back to medicine. This caused a painful break between the two, but his father wisely decided to let him continue with music and set only one condition: that he pass the baccalaureate examination. 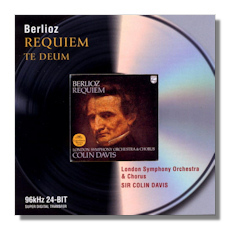 Berlioz threw himself into his studies with an astonishing appetite for hard work. He studied composition with Joseph LeSueur (1760-1837), who became a beloved mentor, his only real friend among the professors of the Conservatoire, although his influence on Berlioz's music wasn't great. Berlioz got from him mainly a theory on the formation of chords and the notion that music should be designed to fit its performing space. Far more important – in fact, decisive – was Berlioz's encounter with the Third and Fifth Symphonies of Ludwig van Beethoven in 1828. 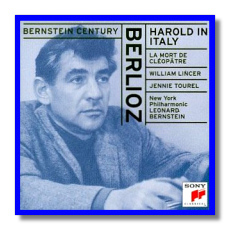 However, Berlioz had the reputation of "wild man" at the Conservatoire well before he had heard Beethoven. He tried several times to win the Prix de Rome, mainly as a way to prove to his parents that music would be a viable career. He succeeded in 1830 with the most pallid of his entries, a cantata called La mort de Sardanapale. He wrote it not out of inspiration, but, on Lesueur's advice, with the cold-blooded calculation of appealing to the prize judges. Still in the Conservatoire, he began to write characteristic work: the Messe solennelle (1824), the Waverly overture (1828), the opera (still unpreformed) Les francs-juges (1826), 8 scènes de Faust (1829), and the Symphonie fantastique (1830), probably his best-known work. 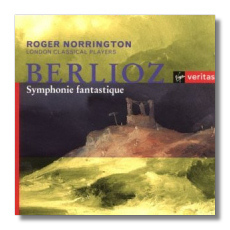 Berlioz's language draws from a very odd mix: the rhythmic freedom and harmonic boldness of Beethoven combined with an almost 18th-century French view of melody and an idiosyncratic, very modern conception of the orchestra. 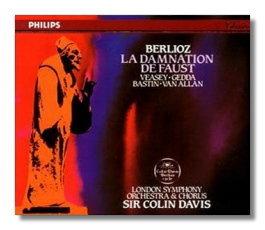 Berlioz wanted very much to have his orchestra "speak." Orchestration was not a matter of laid-on color but an integral part of the musical drama. Not one of his scores uses the orchestra in the same way. He had little use for academic counterpoint, and it shows. His fugues, for example, move with a four-square clunkiness. On the other hand, he is brilliant when it comes to delineating simultaneous planes of different musical activity, as in the opening to his Roméo et Juliette symphony (1839), depicting the Montegues' fight with the Capulets. The dramatic inspires his art. Although he is a master of so-called "organic" form, form is almost never the point. It serves the story the composer wants to tell. As a result, modern critics have tended to look down on Berlioz as incapable of "absolute music," which they deem a higher art than narrative music. This is a distinctly modern prejudice. The present hierarchy stood on its head in Berlioz's time. After all, Richard Wagner proclaimed opera the highest musical form. 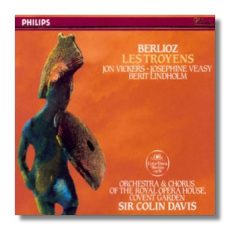 Even today, Berlioz seems a rare taste. He may well be the first true avant-garde composer. His scores continue to baffle many writers. His reception in France is still precariously slender, despite such great advocates as Charles Munch and Pierre Monteux. 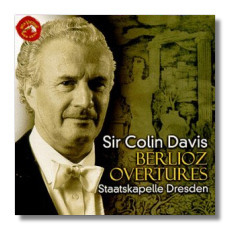 His reputation began to rise only forty years ago, with Colin Davis's production of Les Troyens and the issue of the so-called Berlioz edition – recordings of almost all his major works. This has led to somewhat of a re-evaluation. 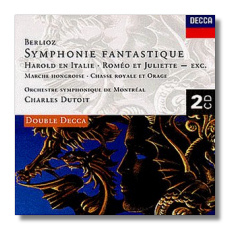 As a younger man, Berlioz allied himself with the progressive forces surrounding Franz Liszt, although he never followed a party line (he adored the conservative Felix Mendelssohn's music, for example). However, he drew the line at middle Wagner, whom he admitted not to understand. While he didn't break with Liszt, their relations did cool. Against the odds, he and Johannes Brahms became mutual admirers. 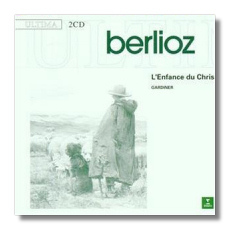 For a major composer, Berlioz had little success, at least in France. He lost money on almost every concert he put on. He went into debt to have his scores copied. The Conservatoire went out of its way to deny him resources. His fellow composers politicked against him to deny him commissions (sometimes even after he had been awarded a commission). The French critics were largely clueless, but these were the same critics who thought Beethoven vulgar, if not insane. One of them went so far as to publish a successful "corrected" edition of the symphonies – in other words, the symphonies as Beethoven should have written them. Berlioz was, however, recognized as perhaps the greatest conductor of his day, but he never received a permanent appointment to lead a French orchestra. In the 1850s, he gave up composing altogether for a considerable time. Indeed, there is a story of how he had composed an entire symphony in his head and refused to write it down, mainly because he didn't want to lose money and effort on a disappointing reception. His masterpiece and his great labor of love, the opera Les Troyens (1858), was not performed as he had conceived it until more than a century after his death. 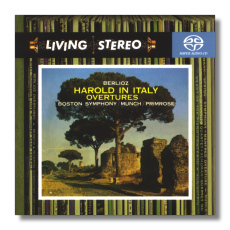 To make ends meet, Berlioz toured as a conductor, leading admired performances of his music in England, Germany, and Russia. His greatest triumphs lay outside France, but he couldn't bear to leave Paris. Mainly, he wrote music criticism, which provided a small, but steady income. He became one of the masters of French prose. This took time from composition. Compared to his contemporaries and despite the monumental nature of so much of his work, his catalogue is fairly small. He needed free time for composition and couldn't afford to give up criticism. Compared to his contemporaries, he is a strikingly modern critic, not least in his insistence on fidelity to the score and his inclination to allow that the composer might know what he's doing. He never puffed his friends without reason nor disparaged his enemies unless on aesthetic grounds. Scrupulously honest, he always risked alienating the most important producers, patrons, composers, and performers in Paris. He published some of his criticism in the witty Les Soirées d' Orchestre (1852) and also wrote his memoires (published, 1870). The moral of his memoires seems to be "Don't ever become a musician!" His most lasting musical publication was his Treatise on Instrumentation, the first comprehensive study of modern orchestral instruments and part of most composition students' library (including Gustav Mahler and Richard Strauss) until Nicolai Rimsky-Korsakov, who based his own orchestration textbook on it. When Berlioz finally was elected to the French Légion d' honneur in 1864, the remark that made the rounds of Paris was, "They were supposed to elect a composer. Why did they choose a journalist?"